Production will be strictly limited to 222 individually numbered units. It’s been ten years since the first V10-powered Audi R8 debuted at the Detroit Auto Show back in January 2009. To celebrate a decade of V10 power, Audi is launching a new special edition version of its mid-engined supercar based on the R8 V10 Performance Quattro facelift that launched last year. Dubbed the Audi R8 V10 Decennium, the new special-edition model will only be sold as a coupe and will debut at the 2019 Geneva Motor Show next week. Distinguishing the special R8 model is an exclusive matte Daytona Gray finish contrasted with a matt bronze finish applied to the milled 20-inch wheels and the intake manifold of the 5.2-liter FSI engine. Elsewhere, the front spoiler, the side sills, and the diffuser are painted in gloss black, supplemented by black Audi rings and badges on the exterior. The side blades and the exterior mirror housings are made from gloss carbon fiber. 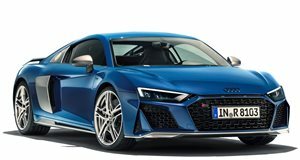 If you would prefer a different color, Audi will also sell the special-edition R8 V10 in several other metallic finishes including Suzuka Gray, Floret Silver, Mythos Black, Ascari Blue, and Kemora Gray. Inside, the interior is finished entirely in black, with contrasting gloss copper stitching applied to the sports seats. The selector lever and the Alcantara steering wheel also feature copper-colored stitching, as do the center armrest, the door armrest and the door rail. A "Decennium” logo adorns the center console, the doors, the inlays in the gloss carbon fiber door sill trims as well as the logo projector. Being based on the new range-topping R8 means the Decennium is powered by a naturally aspirated 5.2-liter V10 engine that produces 620 hp and 428 lb-ft of torque, enabling the mid-engined supercar to do the 0-62 mph sprint in 3.1 seconds and top out at 206 mph. Production will be strictly limited to just 222 individually numbered units, each costing €222,000 (around $253,000) in Germany. For comparison, the regular R8 V10 Performance Quattro starts at €200,000 (around $228,000). Customer deliveries will begin in Germany this spring. The car will also come bundled with a bespoke car cover featuring bronze embroidery with the Decennium motif.